In this article we set out five factors to consider in relation to falling offshore wind costs and their impact on the evolution of European energy markets. Competition between European utilities to deliver offshore wind projects is hotting up as companies refocus their business models towards renewable generation development. The low carbon generation technology landscape has been redefined by the results of two offshore wind tenders over the last month. DONG won a July tender to develop two 350MW projects off the Dutch coast at a jaw dropping 72.70 €/MWh. Only to be out done by Vattenfall who won a 350 MW Danish offshore tender last week for 63.80 €/MWh. These numbers have smashed a cost target set by DONG in 2012 to reduce offshore costs below 100 €/MWh by 2020 (at the time costs were around 160 €/MWh). Costs reductions are being driven by factors such as technology innovation, larger turbine sizes, falling raw materials prices and lower financing costs. Low tender prices in the Dutch and Danish auctions also reflect governments de-risking tendering processes by easing consenting, providing relevant wind & ocean data and excluding grid connection costs. Falling offshore wind costs come at an important time for the European renewables industry. Consumers and governments across Europe have become more sensitive to rising low carbon subsidy related charges on electricity bills. But the combination of falling offshore wind costs and lower commodity prices is helping to alleviate consumer pain. Because of its rapidly declining cost curve, offshore wind now appears to be gaining a significant advantage in the low carbon technology race. Onshore wind sites are increasingly hard to find and technology costs are maturing. The costs and delivery risk associated with nuclear plant are rising rather than falling. The lifecycle environmental and sustainability benefits of large scale biomass look to be increasingly dubious. And large scale solar is a difficult prospect in most of Europe given winter peak loads and lower load factors. The UK National Audit Office published a report in July 2016 which contained analysis of different low carbon technology costs. Chart 1 shows how mature (2025) technology costs estimates have evolved over the last six years. 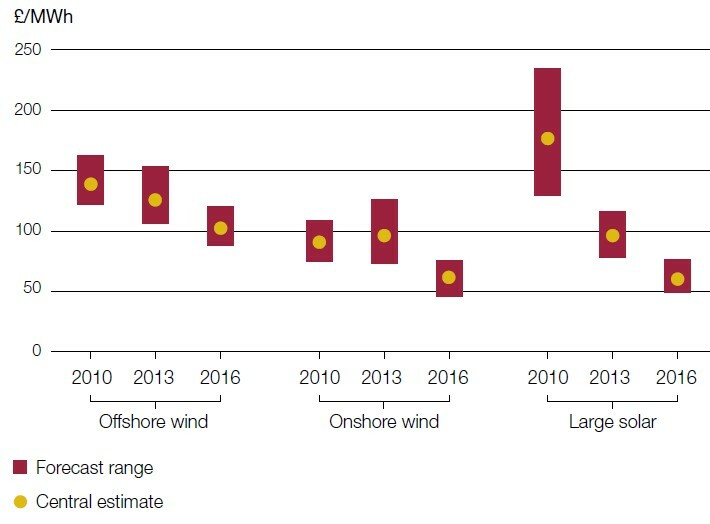 The downwards trend is clear and this analysis does not account for the shock cost reductions this summer which are clear evidence of faster cost decline rates for offshore winds. The scale and cost of European support for low carbon technology has not been without its critics. On a global scale, the direct emissions reduction benefits from European renewable generation development are relatively small. But a key argument supporting consumer-borne subsidies has been that they spur technology cost reduction benefits that can be enjoyed globally. Support for offshore wind appears to be paying clear dividends in the form of falling costs. This has been assisted by genuine benefits from using competitive allocation mechanisms for development support, as opposed to governments trying to negotiate bilateral agreements. The recent Dutch offshore tender also illustrates the benefits of improved quality and transparency of information on project value drivers such as project permitting, wind speed data and sea floor characteristics which benefit both project developers and investors who need to incorporate lower risk premiums into their project evaluation. The same cannot be said for nuclear technology. Falling offshore wind costs make last week’s decision by the UK government to proceed with the Hinkley Point C project, and its 35 year £92.50 (108 €/MWh) guaranteed inflation adjusted fixed price, even more controversial. The government has indicated it intends to try and renegotiate terms with investors to reduce the estimated cost burden of the project (~£30 billion). But as it stands, Hinkley Point looks to be an increasingly bad deal for consumers, particularly in a world of lower commodity prices and declining offshore wind costs. Falling costs and the increasingly competitive nature of offshore wind are likely to provide a boost to the volume of capacity developed across Europe. This may be particularly important in countries that are constrained in their ability to develop onshore wind. Some of the big hurdles that faced offshore developers at the start of this decade are also starting to fall away. Regulatory frameworks are being developed to deal with the complexity and cost of offshore transmission networks. Governments are implementing streamlined and de-risked tender processes to ease the burden on project developers. Investors are getting more comfortable with project financing. Wind farm sizes are also increasing in parallel with the development of larger turbines (with unit sizes now approaching 10MW) leading to increasing economies of scale. These factors combine to suggest higher capacity build rates in offshore wind. Unfortunately the headline tender price levels for offshore wind do not tell the whole story. Part of the reason that the recent Dutch and Danish tender results look so low is that the system costs that result from offshore wind development are being pushed onto the consumer via other charges. Transmission connection costs and risk vary significantly by project based on wind turbine distance from existing networks and the ability of multiple closely located projects to share new connection costs. And the direct costs of connection are only part of the cost burden that offshore wind places on electricity markets. There can be significant knock on cost requirements to upgrade the onshore transmission network to accommodate wind. This is particularly the case if the development of offshore wind is focused in areas that are isolated from customer load centres, such as those off Scotland in the UK. Higher wind volumes also act to increase system balancing costs given the intermittency of wind output. The intermittent nature of wind also means it needs to be backed up by flexible generation capacity particularly where there is insufficient grid interconnection to allow market forces to balance volume variability within and across national borders. This means higher costs in the form of capacity payments to support adequate flexible capacity. Large scale electricity storage may one day reduce the requirement for flexible generation, but current costs and capabilities of utility-scale storage suggest this will not be for many years into the future. Demand-side response offers further potential to balance intermittent generation, but similarly is dependent on smart grid and development of new incentive mechanisms. There is set to be a strong relationship between increasing volumes of European wind capacity and higher power price volatility. Volatility comes both from price rises when wind levels are low and increasing periods of low/negative prices during high wind periods. There are sometimes geographical diversification benefits in wind patterns that can help smooth the impact of intermittency as interconnection between European markets improves. But the speed and scale of volume swings in wind output will continue to feed through into higher prompt volatility. While increasing volatility may make governments nervous, it is an important price signal for the developers of flexible generation capacity. Developers and owners of gas-fired power plants are adapting as intermittent generation increases in order to focus more on returns from flexible operation in response to volatile power prices. Europe is going to need to replace large volumes of conventional generation capacity over the next decade. Coal plants are facing closure across Europe as governments tackle emissions. The European nuclear fleet is set to shrink significantly next decade with net closures scheduled in many countries (e.g. Germany, Sweden, UK, Belgium and Switzerland). Many of the first generation of European CCGTs are also approaching the end of their economic lifetimes. Offshore wind can play an important role in helping to plug the capacity gap caused by conventional plant closures. This will need to be supported by substantial increases in pan-European interconnector capacity to help manage intermittency. But before the arrival of competitive large scale storage technologies, it looks like another generation of gas-fired plants will be developed in order to maintain adequate system flexibility.